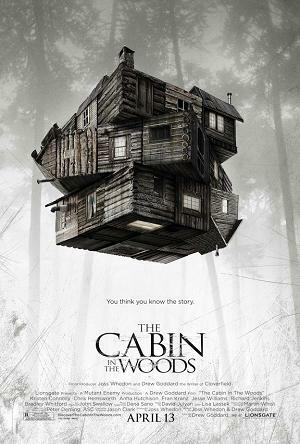 Tag line: "We work with what we have"
There are those who believe that 2012’s The Cabin the Woods is a straight-up spoof of the horror genre, and I have no doubt that, at least to some degree, that’s what writer Joss Whedon and director Drew Goddard were going for when they made it. But, in my opinion, it’s also a loving tribute to the horror movies of old, taking the clichés that have been well-established over the decades and turning them on their heads, resulting in a very original, highly entertaining motion picture. Five college friends: the virginal Dana (Kristen Connolly); uber-jock Curt (Chris Hemsworth); party girl Jules (Anna Hutchinson); the pot-smoking Marty (Fran Kranz); and Holden (Jesse Williams), a newcomer to the group, head deep into the woods to spend the weekend at a cabin owned by Curt’s cousin. As it turns out, this cabin is well off the beaten path. In fact, according to an incredibly rude gas station attendant (Tim DeZarn) they meet along the way, the cabin has changed hands many times, and after what’s happened to some of its previous occupants, nobody bothers to stay there anymore. Undeterred, the group eventually arrives at their destination, and while unpacking they discover a few strange things about the place (including a one-way mirror that separates Holden’s room from Dana’s). But they’re determined to have a good time, which is exactly how the weekend goes until later that first night, when the wind blows open a hatch in the floor, revealing a basement filled with an assortment of odd (not to mention creepy) knick-knacks. One that catches Dana’s eye is a diary from 1906, written by a girl named Patience Buckner, whose family was clearly into some terrible stuff (including torture and murder). The diary’s final entry has a phrase at the end of it, written entirely in Latin. Fearing the worst, Marty begs Dana not to read the passage aloud, but to no avail. And sure enough, those few words penned in that ancient language kick off a chain of events that could spell trouble for all of them. But what these five don’t know is that a pair of technicians, Gary Sitterson (Richard Jenkins) and Steve Hadley (Bradley Whitford), are watching them from the comfort on an underground bunker, and are using high-tech equipment and hidden cameras to track their every move. Sitterson and Hadley are members of an organization that, for reasons unknown, is very interested in what happens to Dana, Curt, and the others. What’s more, there are hints that these two gentlemen, and all of their compatriots, have done this before, and that, despite their often-flippant attitude, something very important is at the center of it all. It’s how these two very different scenarios link together that makes The Cabin the Woods so unique, and such a blast to watch. There is comedy in The Cabin the Woods, to be sure, most of which comes courtesy of Sitterson and Hadley, who, despite the horrors that are descending upon the college chums, seem to view the entire thing as a party. They even operate a betting pool that’s somehow connected to the cabin and its occupants (to explain this connection any further would be a spoiler), and every department that works in the bunker (maintenance, R&D, security, etc.) gets in on the action. As for the five college friends, they are, in many ways, typical of the kind of characters you’d find in a horror movie: young, cocky, sexually active, and a little careless. But as the film progresses, they become even more stereotypical than they were at the outset, and exactly how (and why) that happens adds yet another layer of intrigue to an already compelling story. As for the horror, it’s effective and bloody, and what starts as an homage to both slashers and zombie movies soon expands to include many, many sub genres (all of which contribute to the film’s wild and crazy finale). So even if The Cabin the Woods does take the occasional light-hearted jab at the genre we know and love, it does so in an extremely clever way. And after watching the film, I get the distinct impression that Whedon and Goddard know and love horror just as much as the rest of us.